What is the most efficient way of finding all the factors of a number in Python? Can someone explain to me an efficient way of finding all the factors of a number in Python (2.7)? I can create algorithms to do this job, but i think it is poorly coded, and takes too long to execute a result for a large numbers. This will return all of the factors, very quickly, of a number n.
Why square root as the upper limit? sqrt(x) * sqrt(x) = x. So if the two factors are the same, they're both the square root. If you make one factor bigger, you have to make the other factor smaller. This means that one of the two will always be less than or equal to sqrt(x), so you only have to search up to that point to find one of the two matching factors. You can then use x / fac1 to get fac2. The reduce(list.__add__, ...) is taking the little lists of [fac1, fac2] and joining them together in one long list. The set(...) on the outside is getting rid of duplicates, which only happens for perfect squares. For n = 4, this will return 2 twice, so set gets rid of one of them. 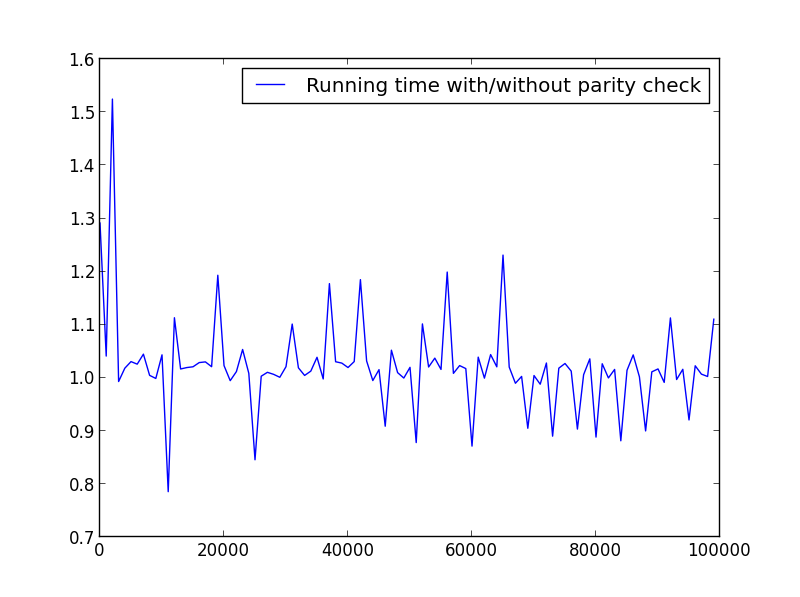 The solution presented by @agf is great, but one can achieve ~50% faster run time for an arbitrary odd number by checking for parity. As the factors of an odd number always are odd themselves, it is not necessary to check these when dealing with odd numbers. I've just started solving Project Euler puzzles myself. In some problems, a divisor check is called inside two nested for loops, and the performance of this function is thus essential. However, on small numbers (~ < 100), the extra overhead from this alteration may cause the function to take longer. I ran some tests in order to check the speed. Below is the code used. To produce the different plots, I altered the X = range(1,100,1) accordingly. I ran it once to let Python compile it, then ran it under the time(1) command three times and kept the best time. I believe that the tricky generator functions version is the fastest possible in Python. But it's not really much faster than the reduce version, roughly 4% faster based on my measurements. q,r = n//i, n%i     # Alter: divmod() fn can be used. l2.append(q)    # q's obtained are decreasing. Idea: Instead of using the list.sort() function to get a sorted list which gives nlog(n) complexity; It is much faster to use list.reverse() on l2 which takes O(n) complexity. (That's how python is made.) After l2.reverse(), l2 may be appended to l1 to get the sorted list of factors. Notice, l1 contains i-s which are increasing. l2 contains q-s which are decreasing. Thats the reason behind using the above idea. I've tried most of these wonderful answers with timeit to compare their efficiency versus my simple function and yet I constantly see mine outperform those listed here. I figured I'd share it and see what you all think. As it's written you'll have to import math to test, but replacing math.sqrt(n) with n**.5 should work just as well. I don't bother wasting time checking for duplicates because duplicates can't exist in a set regardless. This solution works in both Python 2 and Python 3 with no imports and is much more readable. I haven't tested the performance of this approach, but asymptotically it should be the same, and if performance is a serious concern, neither solution is optimal. Here is another alternate without reduce that performs well with large numbers. It uses sum to flatten the list. Be sure to grab the number larger than sqrt(number_to_factor) for unusual numbers like 99 which has 3*3*11 and floor sqrt(99)+1 == 10. This took under a minute. It switches among a cocktail of methods. See the documentation linked above. Given all the prime factors, all other factors can be built easily. Since 10000000000000079 is a prime, the accepted answer's algorithm will never find this factor. Note that it's not just an off-by-one; for larger numbers it will be off by more. For this reason it's better to avoid floating-point numbers in algorithms of this sort. Here is an example if you want to use the primes number to go a lot faster. These lists are easy to find on the internet. I added comments in the code. assert isinstance(n, int), "n must be an integer." assert n > 0, "n must be greather than zero." this is of course still trial division and nothing more fancy. and therefore still very limited in its efficiency (especially for big numbers without small divisors). this is python3; the division // should be the only thing you need to adapt for python 2 (add from __future__ import division). The if sq*sq != num: condition is necessary for numbers like 12, where the square root is not an integer, but the floor of the square root is a factor. Note that this version doesn't return the number itself, but that is an easy fix if you want it. The output also isn't sorted. I timed it running 10000 times on all numbers 1-200 and 100 times on all numbers 1-5000. It outperforms all the other versions I tested, including dansalmo's, Jason Schorn's, oxrock's, agf's, steveha's, and eryksun's solutions, though oxrock's is by far the closest. In reference to the use of square root, say we want to find factors of 10. The integer portion of the sqrt(10) = 4 therefore range(1, int(sqrt(10))) = [1, 2, 3, 4] and testing up to 4 clearly misses 5. Unless I am missing something I would suggest, if you must do it this way, using int(ceil(sqrt(x))). Of course this produces a lot of unnecessary calls to functions. 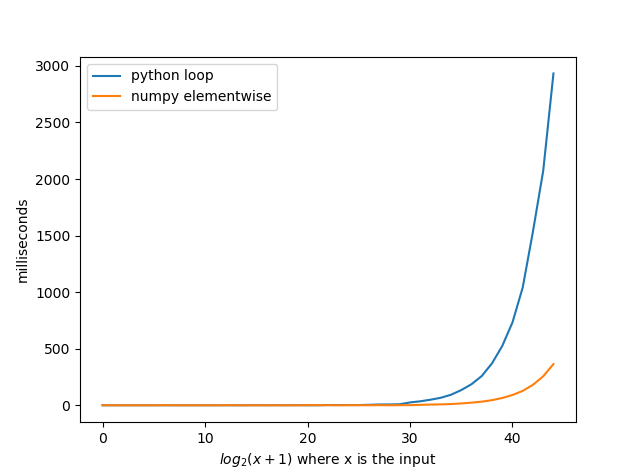 I was pretty surprised when I saw this question that no one used numpy even when numpy is way faster than python loops. 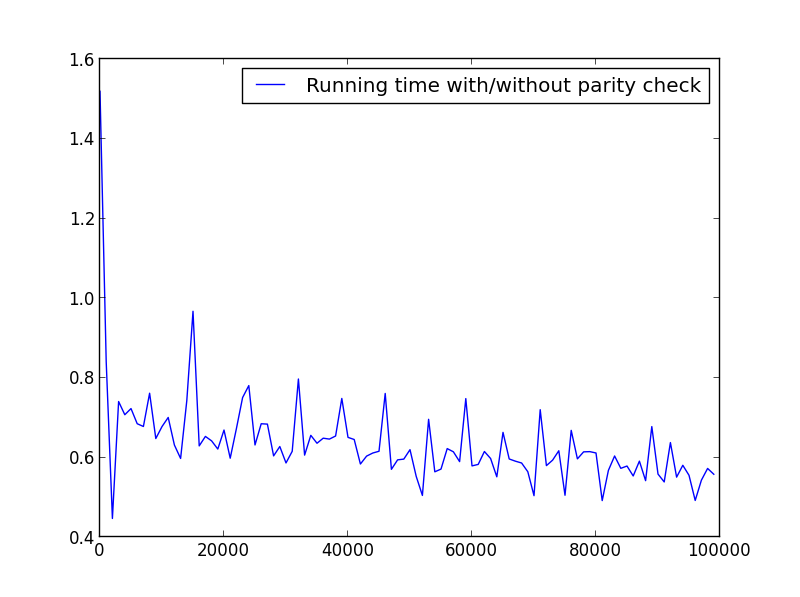 By implementing @agf's solution with numpy and it turned out at average 8x faster. 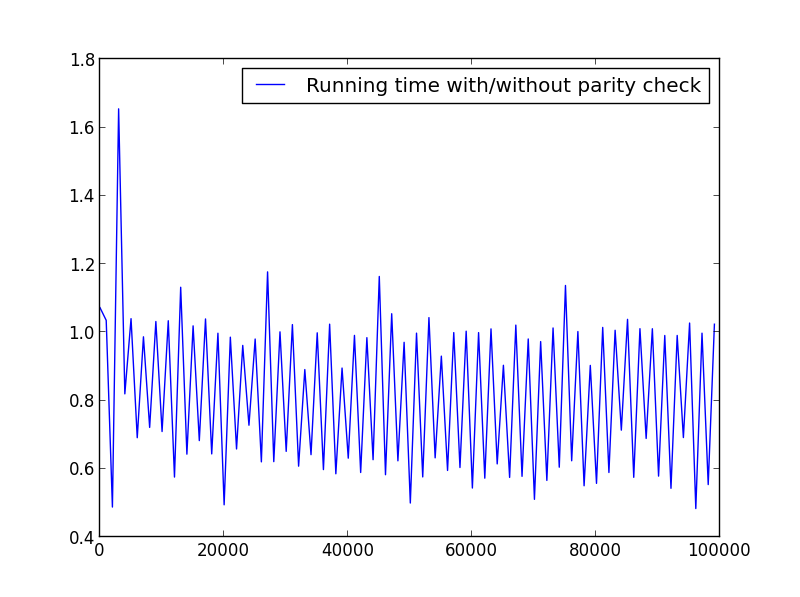 I belive that if you implemented some of the other solutions in numpy you could get amazing times. Pierre Vriens hopefully this makes more sense. this is an O(nlogn) solution. Not the answer you're looking for? Browse other questions tagged python algorithm python-2.7 performance factorization or ask your own question. 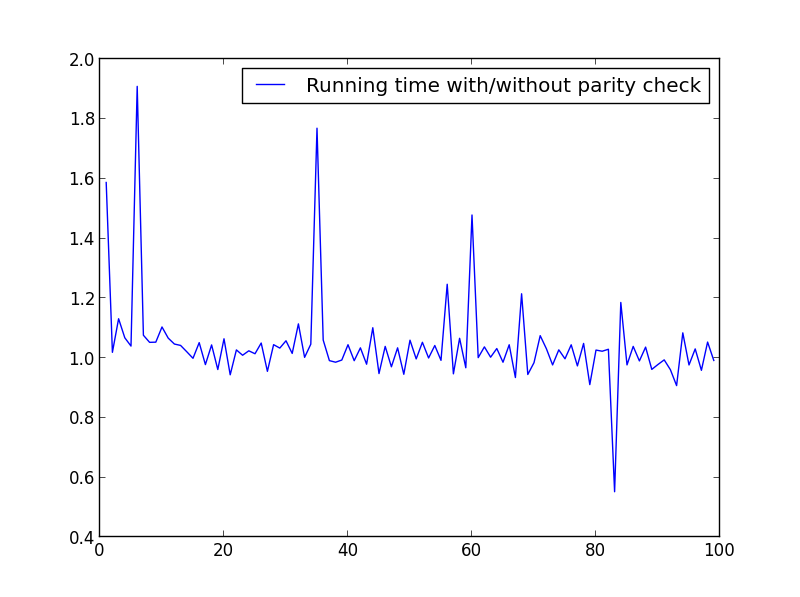 Time complexity of c++ math library pow() function? Why is time complexity O(1) for pow(x,y) while it is O(n) for x**y? What is the most efficient way to find amicable numbers in python? Most Efficient Way to Find All the Factors of a Number?